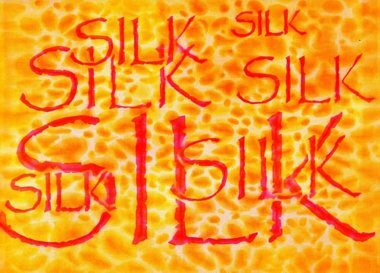 I was recently asked how lettering could be applied to silk using silk paints. I decided to try using the 'stencil into wet silk paint' technique that I have been developing. I kept the lettering simple and used the word 'SILK' repeated several times in different sizes to form a decorative design. I fixed a copy of my design with masking tape behind a sheet of overhead projector film and cut out the letters using a scalpel. The stencilling technique involves laying a stencil into wet painted silk and drying with a hairdryer. Once I was ready to paint, I wet the silk with clean water and used diluted orange and yellow paints with a pebble pattern stencil to create the background effect. I then wet the silk again and painted it with a diluted magenta. I laid the lettering stencil into the wet paint and dried the silk with a hairdryer. As I lifted the stencil from the dried silk the lettering appeared as if by magic.